Amidst a scarcity of resources, evolving and urgent economic, social and infrastructure issues put pressure on our communities to make choices now that will dramatically impact their future. Communities are turning to Registered Professional Planners (RPPs) to professionally inform these choices. RPPs’ knowledge and experience support decision-makers on the path to sustainably built, social and natural environments. 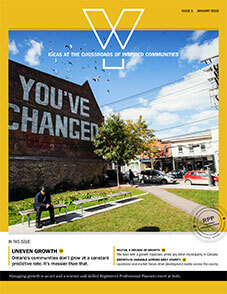 The result: truly inspired Ontario communities. As lifelong learners, professional planners are committed to staying ahead of planning issues and trends, and that knowledge and experience is displayed here. In carefully considered Calls to Action that challenge community stakeholders in all roles and disciplines to join together in the creation of healthy, sustainable communities. In advocacy that demonstrates the responsible, diligent planning process followed by RPPs to best support their local government or ministry with sound advice and counsel. Or in the Planning Exchange Blog, where OPPI members and RPPs express and share with one another their professional planning perspectives, that come from a variety of sources, on current issues. They also seek to improve and hone their craft on a constant basis to keep up with community change - the Continuous Professional Learning (CPL) hub is available to RPPs for that purpose, and Learning Units are a requirement for maintaining their designation.